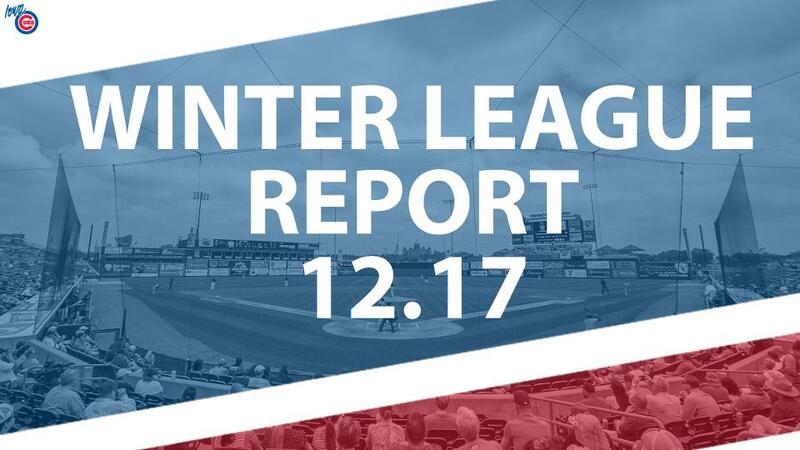 Throughout the offseason, we'll check in with former and future Iowa Cubs playing winter ball. This week's segment highlights the Mexican Winter League. Concepcion appeared in six games for Caneros de los Mochis, five of them starts, between Oct. 14 and Nov. 16. He's allowed at least two earned runs in each of his outings, amassing a 7.20 ERA (16ER/20.0IP). He's struggled with control as he's walked 18 with just 16 strikeouts. Concepcion pitched for the I-Cubs in 2016, going on to debut for Chicago that season. He appeared in three games and collected a 3.86 ERA (1ER/2.1IP) for the World Series Champion Cubs. The lefty appeared in seven games for Double-A Tennessee in 2017 before getting released on May 12. His current Winter League stint is his first in professional baseball since. Garcia has appeared in three games with two starts in the LMP, compiling a 1.93 ERA (2ER/9.1IP) with no record. He's walked three and fanned six. Garcia never threw a pitch in an Iowa Cubs uniform due to cancellations on two of Iowa's last three home dates, but he did appear on the roster from Sept. 1-3. He appeared in eight games for Chicago in September, going 0-1 with a 4.70 ERA (4ER/7.2IP). Garcia was drafted by the Cardinals in 2005 and is a free agent this offseason. Campana began his winter league stint on Dec. 4 and has hit for a .375 average (3-for-8) with one triple through three games. His last game came on Dec. 6. Formerly a Cubs 12th round draft pick out of the University of Cincinnati in 2008, Campana played in the Cubs system until 2012 with 67 games logged with Iowa and 184 with Chicago. Campana has been a journeyman since, playing the Diamondbacks' organization in 2013 and 2014, the Diamondbacks and the Angels in 2014, and the White Sox and Nationals in 2016. He last appeared in affiliated baseball with Triple-A Charlotte in 2016. Baldonado is thriving in the LMP, posting a 1.93 ERA (3ER/14.0IP) through 13 games. He has not allowed an earned run through his last nine games - a span of 9.1 innings - and has allowed just four his with four walks through this span. Taking on a long-relief role for Iowa in 2018, Baldonado led the I-Cubs in wins (7) and the bullpen in innings pitched (59.0). The lefty was originally signed by the Mets in 2010 and spent his minor league career in the organization until 2018. He is a free agent this offseason. Beeler has collected a 2.03 ERA through five starts in the LMP, allowing 19 hits and whiffing 15 through 26.2 innings. He's pitched at least 5.0 frames in each of his starts, going a season-best 6.2 frames in his winter league debut on Oct. 14. The righty was selected by the Cubs in the 41st round of the 2010 draft out of Oral Roberts University. He made his way to Iowa in 2014, going 9-6 with a 3.40 ERA (47ER/124.1IP) through 20 starts. Beeler's career was derailed by injury as he missed the majority of 2016 due to right shoulder inflammation. He missed all of 2017 before serving a short four-game stint with Double-A Northwest Arkansas, a Kansas City affiliate, in 2018. He is a free agent. Coleman is dominating the LMP with a 2-0 record and a 1.47 ERA (5ER/30.2IP) through 29 appearances. His ERA drops to 0.90 (1ER/10.0IP) through his last 10 games. Coleman has collected 31 strikeouts while walking just three and is holding opponents to a .168 batting average. Coleman was selected by the Cubs in the 15th round of the 2008 draft and spent more than six seasons in the organization before he was released early in 2014. Coleman then returned to the Cubs and to Iowa after journeying around baseball from 2014-17 - a time that included an Independent League stint. He went 2-4 with a 6.91 ERA (22ER/28.2IP) through 10 games (5GS) with the I-Cubs in 2018. He is a free agent this offseason. Russell started six games in the LMP from Oct. 12-Nov. 17, posting a 3.31 ERA (13ER/35.1IP). He recorded two quality starts and pitched 5.0 or more frames in five out his outings. He walked just one through 35.1 innings while fanning 29. Selected by the Cubs in the 14th round of the 2007 draft, Russell ascended to Iowa in 2009 and appeared in 31 games for the I-Cubs across three seasons. He was traded with infielder Emilio Bonifacio to Atlanta for current Cubs catcher Victor Caratini and cash in 2014, but found his way back to the organization with a minor league contract in 2015. Russell has seen time in the systems of Philadelphia, Cleveland and Detroit since, most recently playing for Triple-A Toledo in early 2018. He is a free agent. Through 34 games in the LMP, Solis is batting .264 (28-for-106) with three doubles, four home runs and 18 RBI. Solis has logged 14 seasons with six different organizations in professional baseball, originally signing with the Padres in 2005. Solis has suited up for Iowa in each of the last two seasons and holds a.160 (52-for-324) batting average through 85 games. Giansanti spent time in the LMP Oct. 31-Nov.11, batting .296 (24-for-81) with four doubles, one home run and 10 RBI through 23 games. Giansanti spent his minor league career (2010-16) in the Cubs system and logged 19 games with the I-Cubs across two seasons. He was released by the organization on May 15, 2016 and has since been playing in the Independent League. Negrin has appeared in four games in the LMP, collecting a 2-0 record with a 3.18 ERA (6ER/22.2IP). He allowed just two earned runs through 11.2 innings through his first two starts before allowing five earned runs through 5.0 frames on Dec. 8. He bounced back with a quality start on Dec. 14 in which he gave up one run through six frames. Originally signed by the Cubs in 2011, Negrin first appeared in Iowa in 2012 and amassed a 0-1 record with a 3.60 ERA (6ER/15.0IP) through three starts. Negrin suited up for the I-Cubs in each of the next three seasons before he was loaned to Leones de Yucatan by the organization in 2015. He has been playing in the Mexican League since. Villanueva played 19 games in the LMP - the last coming on Nov. 30. The 27-year-old hit .227 (15-for-66) with four doubles, three home runs and 11 RBI. He walked 15 times while fanning just 13. Villanueva was acquired by the Cubs from Texas at the deadline in 2012 with RHP Kyle Hendricks for RHP Ryan Dempster. Villanueva's Cubs career was derailed when he fractured his right fibula in Spring Training in 2016. The third baseman was declared a free agent after spending the season on the disabled list and eventually signed with San Diego. Villanueva has a break-out year in 2018, hitting 20 home runs through 110 games with the Padres, though he hit just .236. He was released by the team on Nov. 21 and is a free agent.